ABC worksheets come in all shapes and sizes, including this one! Some are just for tracing and writing letters, some for circling letters, some have kids circle the objects that start with a certain letter, and some have kids color the letters. This one combines all those things into one worksheet specifically for the letter O. Uppercase and lowercase practice and recognition is a part of this worksheet. So, get out the crayons, the pencils, and put on the thinking caps. 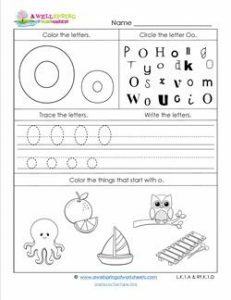 This letter O worksheet awaits!